Democrats are watching President Trump's health care approval numbers increase among voters just as many Americans are seeing bumps in their paychecks from the GOP tax law. Ahead of the 2018 midterms, Democrats — often criticized for not having a unified message — are now being advised to tie taxes and health care together when campaigning. The state of play: A senior Democratic aide told Axios about the party's plan: "Anything middle class voters are seeing extra in their paychecks from the GOP tax scam will be offset by higher health care premiums and costs, so we will encourage Members to highlight that early and often." Driving the news: There's a battle brewing between Democrats and Republicans over who is to blame for rising health insurance premiums, which are expected to sharply increase just before the November election after Congress' latest omnibus left out federal money to support insurance exchanges, per WSJ. The Democratic aide added that Democrats recognize these issues are extremely important to many voters, saying, "Dem Members will strongly be encouraged to highlight the failed TrumpCare effort and votes by Rs to take away health care from millions and cause costs to skyrocket." Priorities USA, a progressive super PAC focused on digital advertising, has been encouraging Democrats to push a strong economic message. 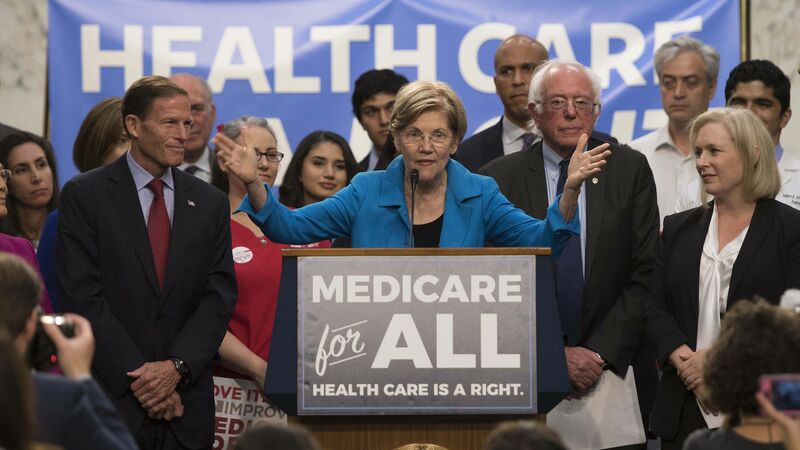 But now they're pushing for candidates to refocus that message to include health care: "Democrats need to seal the deal by talking about economic issues, health care being one of those," said Josh Schwerin, the PAC's communications director. Expect to see Democratic candidates' ads about tax reform also highlight health care, like this ad the group created for Sen. Joe Donnelly in Indiana. What's different this time: Schwerin argues "the threat to Medicare is more real than it has been in the past" and that — because Republicans control both houses of Congress and the presidency — voters recognize they own the threat to health care and the rising insurance premiums. A Priorities USA survey from February showed Trump's approval rating on health care policies and tax policies had increased by 11% and 14%, respectively. At the same time, the group is encouraging Democrats to focus on how "Trump’s policies are adding to the economic burdens of average families by raising the cost of health care and driving up insurance premiums." Be smart: The real challenge for Democrats will be choosing a more moderate or progressive health care message. Voters are split 48-46 on wanting a national health plan and simply wanting improvements to the Affordable Care Act, according to a March Kaiser Family Foundation poll. But the timing of the expected insurance premiums increase could help Democrats; another Kaiser poll found health care costs are the top health care issue voters want candidates to talk about in 2018. The bottom line: Democrats not only need to talk more about the economy and health care, but their message will have to be as detailed and unified as possible. "When you point out that Republicans passed a $1.5 trillion tax cut that helps the wealthy and that they were going to try to pass it by cutting health care, it ties it all together to show their priorities," Schwerin said. DCCC polling encourages Democrats to show a willingness to work with Trump. Democratic candidates from Utah to New York are going hard on health care in their ads. New peril for moderate Dems: voters are happy with Trump's economy.